shelly's summary: STATE CHEER CHAMP BABY!!!!!!!!! 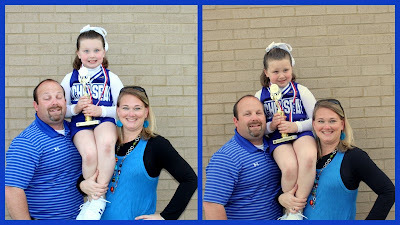 last weekend brylee had her state cheerleading competition at a local high school.... they ROCKED the house and did an amazing job... i was so proud of her and her squad!!! I will say that when we signed up to be on the competition squad i really did not know all the life lessons brylee would learn just from being on a cheer squad with 15 other kindergarten and first graders. She learned perseverance, determination, hard work ethic, and the importance of being a team member just to name a few. These girls worked HARD! They practiced 3 to 4 times a week for 1.5 to 3 hours for 2 months and the weekend before the competition they practiced 3 and 4 hours a day... that is a lot of practice from some 5, 6, and 7 year olds. I saw these girls go from a quiet, noodle armed, non-rhythmic group of girls to an awesome LOUD, sharp motioned, "together" group of cheerleaders! And i will say all their hard work paid off!!!! They brought home the GOLD!!!!!! All the cheer groups lined up ready to compete.... can we say intimidating??? this gym was PACKED with 100's of fans... LOUD fans...LOUD music and these girl walked out on that mat and cheered their little hearts out like there were only 10 of their closest friends and family watching!!!! My Little Cheerleader... all smiles! after this is was all a blurr... we all stormed the mat to celebrate with our girls... when i found brylee... this was the grin on her face... and she said " WE WON, WE WON, WE WON FIRST PLACE!!!!!!!!" after they won we all went out to the tent we had set up for them and had a cupcake party.... they were so excited and we were so proud of them!!!!! all came to see brylee girl cheer!!!! we are so proud of you baby girl!!!!! we post two pics b.c he messed up our best one!!!!! You worked so hard for this trophy and you deserve it!!! !